A lopsided season series saw the Flames pick apart the Avalanche in all three games between the clubs this season. However, Colorado enters the playoffs on a good run and are getting great goaltending. That could make the difference. There may have been no worse draw for the Colorado Avalanche, who enter the first round on somewhat of a hot streak as winners of eight of their past 11 contests, than the Western Conference best Calgary Flames. When the former Northwest Division foes have met this season, the outings have been decidedly one-sided, with the Avalanche trying but failing to slow down a Flames offense that was among the league’s best this season. Where this series can change in an instant, though, is in the blue paint. Calgary’s crease woes are no secret, and Colorado has gotten some great goaltending out of Philipp Grubauer in recent weeks. As with any playoff series, netminding can be the difference. If Grubauer shows up and the Flames tandem of Mike Smith and David Rittich does not, we could be in for an upset. The smartest thing new coach Bill Peters did in Calgary was recognize the talent in the Flames lineup and design a game plan that allowed it to flourish. Where once Calgary was a perimeter team that moved the puck mainly on the outside of the scoring zone, the Flames are at their best when they’re making short, crisp passes that can dissect defenses. That has helped boost an offense that ranked 27th a year ago to the top five this season – with a 35-percent hike in scoring, or almost one goal per game. The chemistry between playmaker Johnny Gaudreau, triggerman Sean Monahan and newcomer Elias Lindholm has been electric. And Matthew Tkachuk has developed into a well-rounded offensive tool who can also antagonize the opposition. Peters has encouraged his defensemen to become part of the offense, to aggressively pinch at the blueline and to not always think low-percentage stretch-pass. As a result, 12-year veteran Mark Giordano reached a career high in points by February, and T.J. Brodie saw his plus-minus swing by a measure of 40. Even Travis Hamonic and Noah Hanifin will hit career highs in goals or points despite little power-play time. The Flames struggle when they run into defenses that clog the middle and force them to the outside. During a four-game losing streak in March, Calgary scored just five goals against teams (Minnesota, Toronto, Vegas and Arizona) that created a tight defensive shell with active sticks in interior passing lanes. And even though the neutral-zone trap of yesterday’s era has largely been nullified with countermeasures, the use of it against the Flames can frustrate them before they have a chance to mount an attack. Take the body against the Flames and you’ll wear them down. They’re not a team that ever controls the trenches. Only a few Calgary players have the willingness to push back. X-Factor: The crease in Calgary is unsettled. Age has caught up to 37-year-old Mike Smith. His reflexes are noticeably slower to the point he plays deep in his crease in order to compensate, which makes his 6-foot-5, 220-pound frame look small. He has had spurts of solid play, but his sub-.900 save percentage doesn’t intimidate shooters. David Rittich seized the opening and became the de facto No. 1 as the Flames rose in the West. However, he has run hot and cold since the all-star break. One period he’s ‘Big Save Dave’ and the next he’s prone to giveaways, mental lapses and a desertion of confidence. The Avalanche’s identity one year ago, when they improved by an astounding 47 points to make the playoffs: an exciting but top-heavy team with one dominant line. Nathan MacKinnon, Mikko Rantanen and Gabriel Landeskog scored 36.5 percent of Colorado’s goals. This season: 40.7 percent. Glass half empty: that stat tells us the Avs’ secondary scoring is even worse this season. Glass half full: it’s not that the Avs’ supporting cast is weaker – it’s just that the star trio is even better. 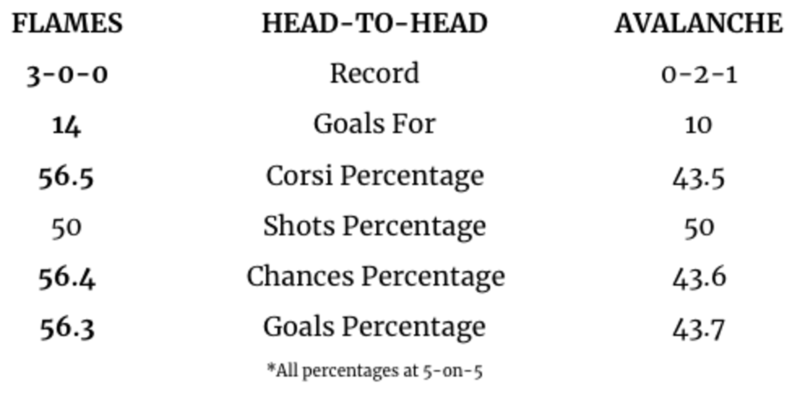 Regardless of the prism through which we see Colorado, we know it can ice one truly outstanding line whenever coach Jared Bednar isn’t experimenting with splitting the group up – and that the Avs still seriously lack scoring depth. No. 3 center Carl Soderberg did crest 20 goals for the first time, but most of the young forwards have stalled aside from J.T. Compher. Tyson Jost got demoted to the AHL for a month. Alexander Kerfoot’s lucky shooting percentage regressed. An injury in March shelved Landeskog for the rest of the regular season, further exposing the crippling lack of depth. Not much else about the Avs stands out aside from their stars. Forever underrated blueliner Tyson Barrie leads a strong power play. He and Samuel Girard move the puck well, while Erik Johnson, Nikita Zadorov and Ian Cole bring physicality on defense. Semyon Varlamov and Philipp Grubauer have provided competent goaltending, not really winning the team games but not losing them, either. It’s a middling roster – but that’s somewhat by design. Colorado GM Joe Sakic didn’t let one ahead-of-schedule season affect his decisions in the summer of 2018. He stayed conservative, knowing his team has last-place Ottawa’s first-round pick this June plus some elite prospects in the pipeline, none better than defenseman Cale Makar. A playoff berth this season is just gravy. X-Factor: The Avalanche are short on experience. Ian Cole is their lone skater with a Stanley Cup ring (with Pittsburgh in 2016 and 2017). But Derick Brassard has some valuable tread on his tires. His 78 games in the past five post-seasons tie him for third in the NHL. From 2013-14 to 2016-17, he went to a Stanley Cup final and two conference finals between the Rangers and Senators. Traded twice this season, he didn’t make a significant impact early on with the Avs, but his smarts and willingness to play in high-traffic areas could help him deliver a clutch moment. He has five career game-winning playoff goals.